Welcome to our interactive calendar. Click on any event you see and a pop-up window will open with details about the event. *Detailed information on events marked with an asterisk can be found further below on this page by scrolling down. kitchen is open most Fridays, not all. Sat: - $1.00 Schnapps all day! Sun: - 12 oz. drafts are $1, all well drinks are $2. Wed: - Happy Hour 3-7 pm; Wine is $.50 off all day! Nov. 3 - Hee Haw Party - Details soon! Dec. 15 - Adult Christmas Party - Details soon! 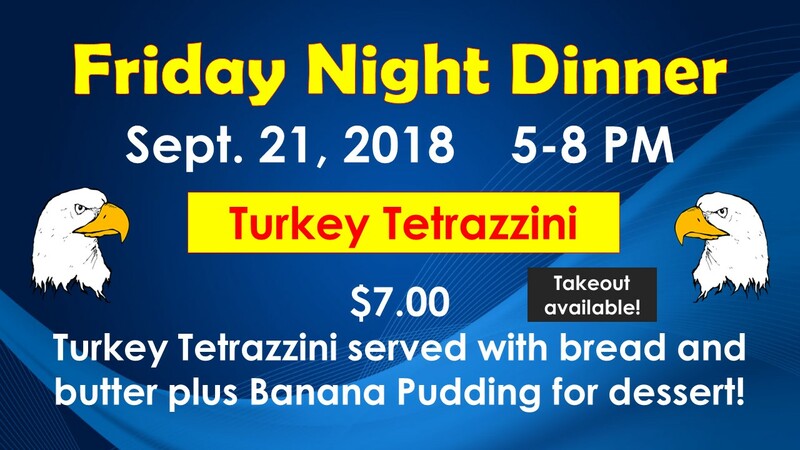 Join us for dinner Friday night, September 21, as we feature Turkey Tetrazzini. Dinner includes Turkey Tetrazzini served with bread and butter plus Banana Pudding for dessert for $7.00. Takeout available. Get your singing list and voice ready for a fun night of crooning out your favorites! Do you have ideas for our New Year's Eve Party? Are you willing to help in some way? 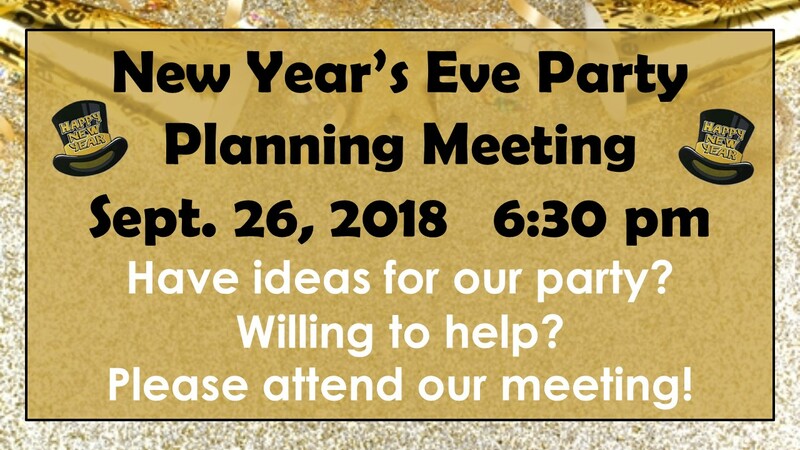 Please join us as we plan for a fun party! 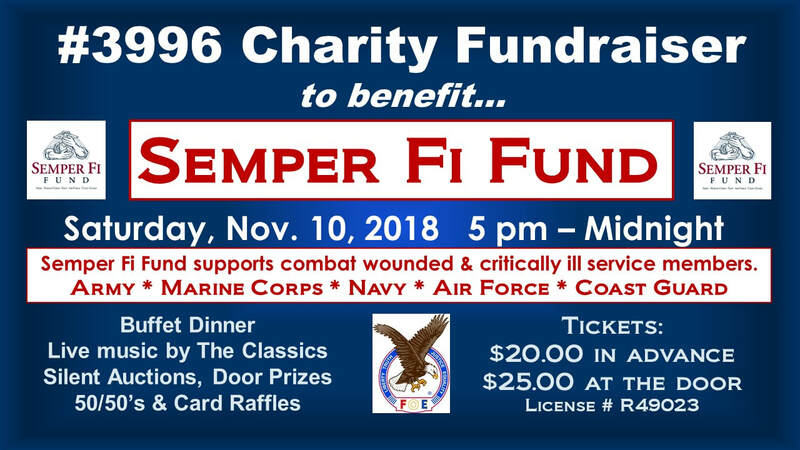 Our charity fundraiser for the Semper Fi Fund is in November and we’re looking for volunteers. 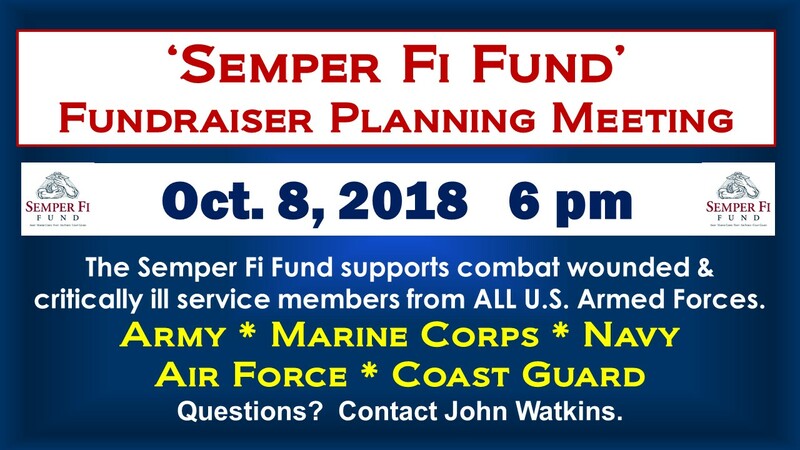 Please join us as we plan! 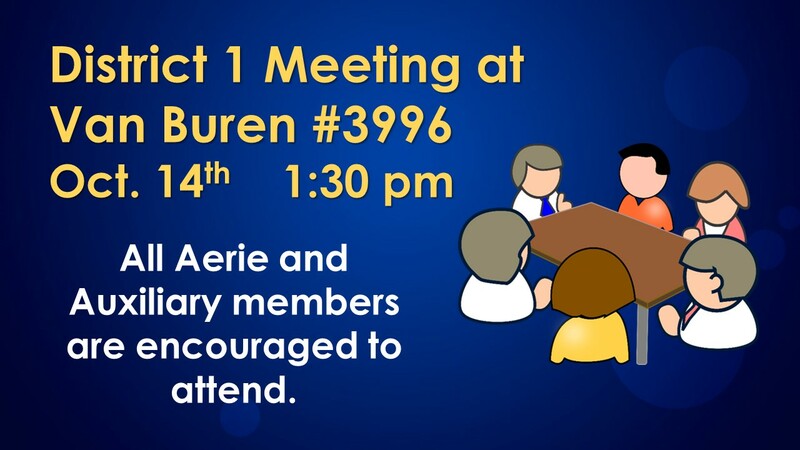 We encourage all Aerie and Auxiliary members to attend the District 1 Meeting at Van Buren #3996 on October 14, 2018 at 1:30 pm. The Children's Halloween Party is always a fun event. We will have games and food for the children. Volunteers are needed and appreciated, let Toni Watkins know if you can help. A sign-up sheet will be in the club entrance soon. We are collecting candy right now for the party; a collection box is in the social hall. Please let us know if your child has an allergy to anything so we can accommodate them. 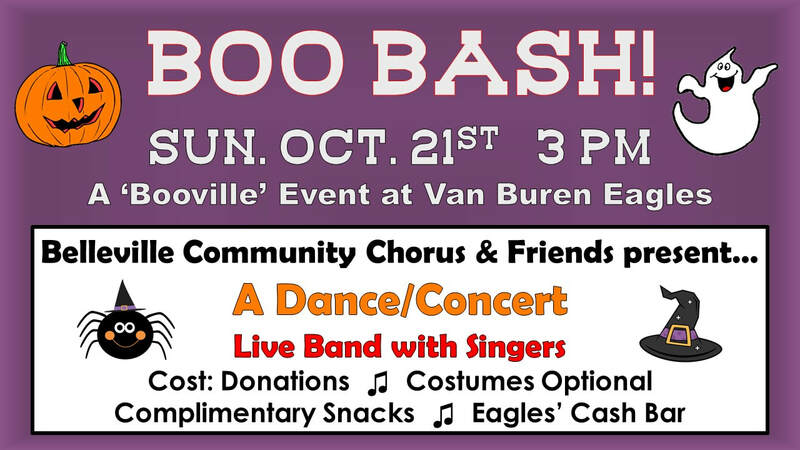 Join the fun as the Belleville Community Chorus and Friends present Boo Bash! A dance/concert featuring a live band with singers. Costumes are optional and complimentary snacks will be provided. Beverages provided by the Van Buren Eagles' Cash Bar. Cost: Donations to the Community Chorus are welcome. Come join the fun! 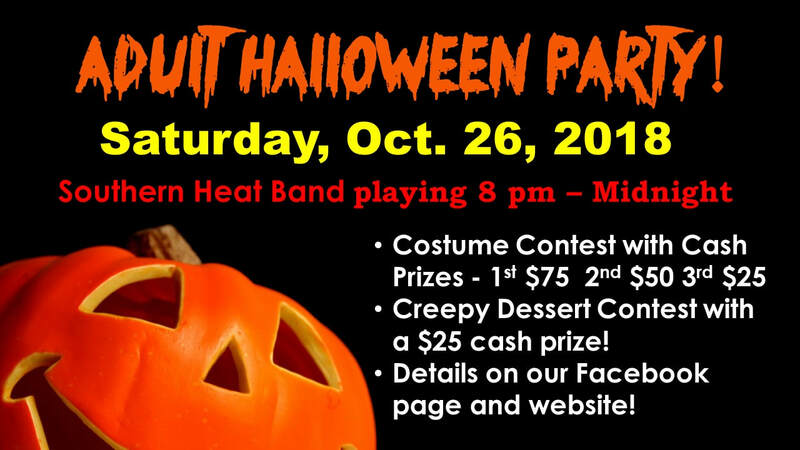 Join us for a rockin' great time at the Adult Halloween Party at the Van Buren Eagles. 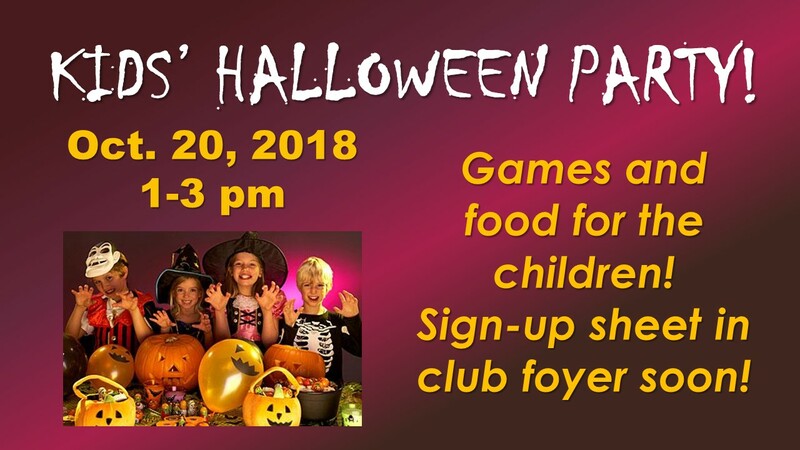 All of our friends are invited to share this spooktacular great time with amazing people. The Southern Heat Band will entertain us from 8 pm - Midnight. We are asking for a donation of $5.00 per person to defray the cost of the band. Costume Contest Judging: At the end of the first band set. FOOD: A prepared dinner will be for sale starting at 5 pm from our kitchen. This is a change from last year, so please do NOT bring a dish to pass this year. Everyone is invited to bring a yummy or creepy dessert (this is OPTIONAL) to share. All creepy desserts will go into a contest to win a $25.00 cash prize. - The dessert must be edible. - The dessert will be judged on originality and creepiness. - Judging at 7:30 pm. Wear your best original, creative costume to have a chance to win one of three cash prizes in the costume contest. Judging will take place at the end of the first band set. 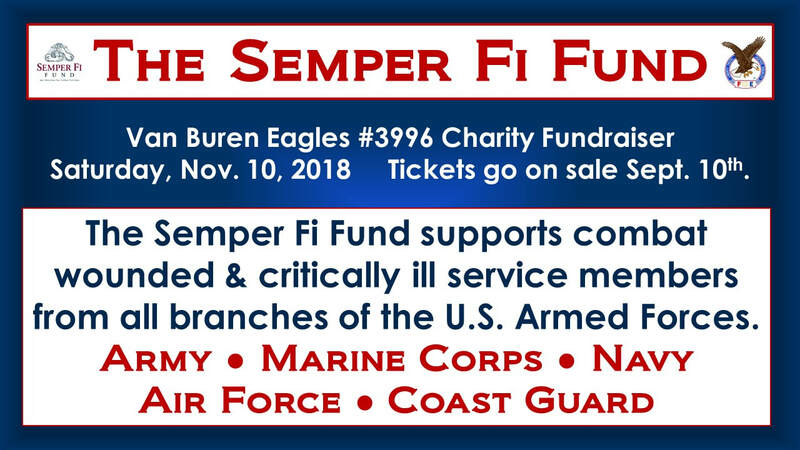 Join us as we raise funds for the Semper Fi Fund, our Aerie president's chosen fundraiser this year. The Semper Fi Fund directly supports combat wounded and critically ill service members from ALL U.S. Armed Forces. -Tickets go on sale Sept. 10th. -For ticket information, please contact Van Buren Eagles #3996 at 734-699-8836 or John Watkins at 734-383-6160. ***We are asking for volunteers to donate new items for the auctions. Please contact John Watkins if you are able to help. 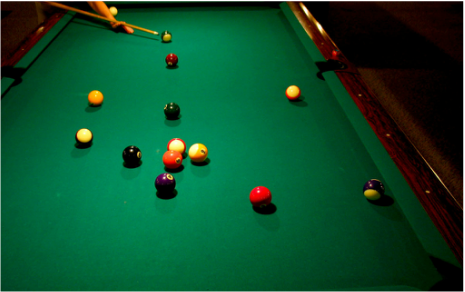 Celebrate New Year’s Eve at the Van Buren Eagles! 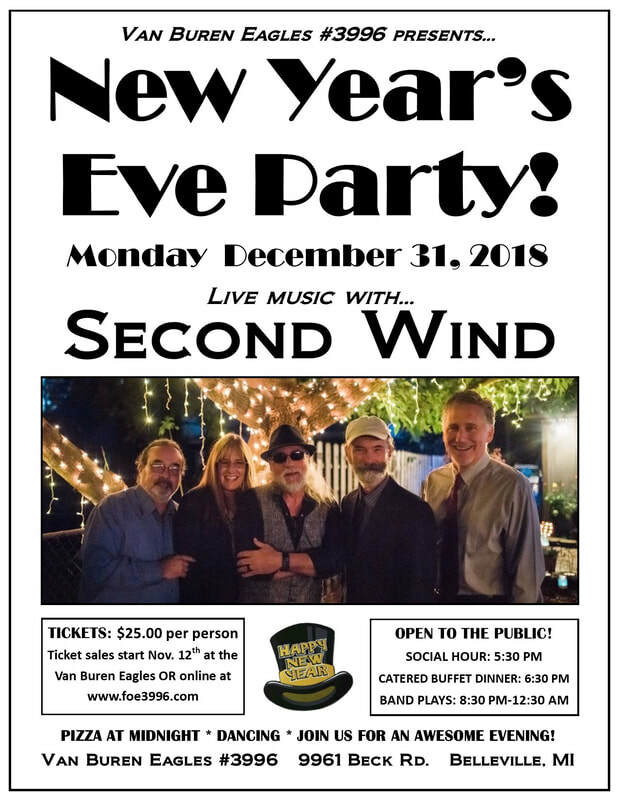 Second Wind will be rocking it out and bringing in the New Year with their awesome music. Join us for a fun evening complete with a catered buffet dinner, live entertainment with Second Wind, fun party favors, dancing and pizza at midnight. Tickets: $25.00 each – Tickets go on sale Nov. 12th in the club and online at www.foe3996.com. Stay tuned for the next Euchre date. Come join us for a fun, friendly game of euchre! Fast 8 round game.